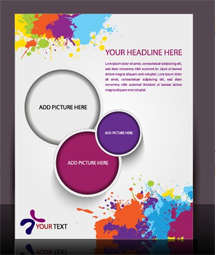 Brochure design is an important part of marketing. It is one among those tools that helps in taking your product to the market. We provide our clients with a brochure design that advertise their products well and also highlight the features and advantages of buying their products. The reader or the consumer is able to get a brief view of our client‘s business prospective and the products and services that they offer. Our team of technical experts develops brochures that not only describes your company well but also highlights what makes you different from your competitors in market. This brochure gives you an identity in the business world and we design the best brochure that describes your company and its features in detail. Our description also clearly describes you as matchless in your field. The brochures differ in their type depending upon the purpose or product they are used for promoting. We take into account your customers, your design specifications, type of product and then provide you with an impressive brochure design. At Tech KB Solutions, we provide a variety of brochure design services as per the client requirements. Some might demand folds or die cuts or embassing to be included into the design. We provide design customization as per our client specifications. We also integrate PDF files and even email brochures that can be easily downloaded in to the brochure design as per the client requirements. But our ultimate aim is to provide a space in the market for our clients and their products with an attractive brochure design.